Brighton have had to wait two agonising months to confirm their Premier League safety, so it felt somehow appropriate that they were forced to hold on for a few extra seconds before celebrating the goal that finally secured their status as a top-flight team. Pascal Gross was convinced his header had crossed the line, and so were the spectators on a frenzied Friday night in Falmer. But still they delayed, watching in anticipation as Craig Pawson, the referee, checked his watch not once, not twice, but three times before finally allowing the party to begin. With one blow of Pawson's whistle, the Amex exploded. After eight weeks without a victory, they were finally closing in on the three points that would turn this season from probable success to undoubted triumph. To claim this crucial win in these circumstances, in their final home game of the season, against the might of Manchester United, made it all the more enchanting. It was a Premier League performance against Premier League titans, and there will be plenty more of this to come next season. United might argue that their minds had been diverted by the upcoming FA Cup final and the knowledge that second place is all but assured. But Jose Mourinho's side were as lifeless as Brighton were vibrant, as dour as Brighton were delighted. For the first time in their history, United have now lost away to the top flight's three promoted sides in a single season, and this was just as poor as those defeats by Huddersfield and Newcastle United earlier in the campaign. The injury to Romelu Lukaku had presented Marcus Rashford with a rare opportunity to start a game from a central striking position, with Anthony Martial darting inside from the left. It was just the second time the pair had begun a match together since the turn of the year, and Rashford was immediately involved as his fierce free-kick was diverted into the net by the knee of the offside Marouane Fellaini after just two minutes. Brighton were saved by the linesman's flag, and the early scare served as a splash of cold water on their faces. Within minutes, Hughton's side were hunting and cajoling, hounding the United midfield like seagulls targeting ice cream on the nearby pier. 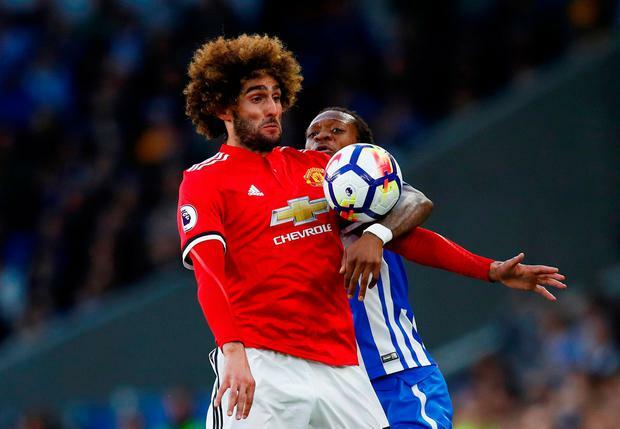 A disjointed United, and the sloppy Marcos Rojo in particular, were easy victims of Brighton's high-octane start. 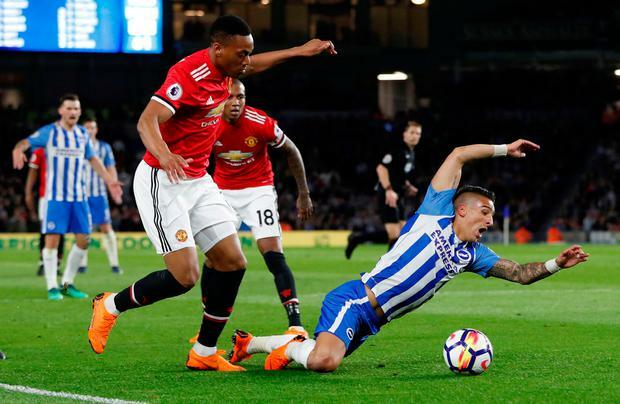 Gross was soon denied by David de Gea, while bustling wingers Jose Izquierdo and Anthony Knockaert were sliding past challenges as if they were on waterskis. Glenn Murray went close, too, with a thunderous effort that brought the best out of the stretching De Gea, before Shane Duffy and then Izquierdo threatened again before the break. Brighton were the more assertive side, and United were missing their focal point in attack. Rashford covered plenty of ground, but it was more out of desperation than purpose. Martial and Juan Mata, the supporting act, were anonymous alongside him. Their frustrations were encapsulated by Rashford's hesitancy when provided with a clear opportunity following a slip by Brighton's Lewis Dunk. Rashford's legs took him into the box, but his brain seemed to have been left behind. He delayed the cross, unsure of what to do, and the move crumbled into nothing. 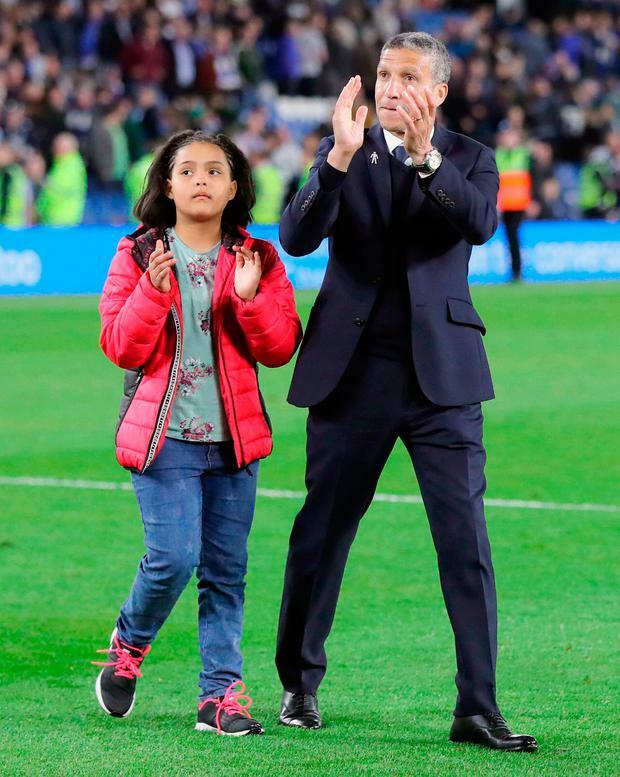 Mourinho, sporting a gilet and tracksuit rather than his usual suit, whirled his arms in anger on the touchline, muttering furiously at Rashford's lack of killer instinct. The United manager was not the only grumbler. Paul Pogba, who more than anyone was trying to set the tone for United, yapped away in the referee's ear over imagined fouls, then threw out his palms in annoyance when his forward runners failed to provide him with a passing option. Pogba at least produced United's first effort on target, a low effort that was stopped by the stooping Mathew Ryan, the Brighton goalkeeper, just a few minutes after the restart. With that, there was suddenly more snarl to United, more impetus, and they were now playing further up the field as they sought to seek control of a game they had been chasing. The higher they pushed, though, the more space they left behind. Izquierdo exploded down the left, into that chasm, before playing a fortuitous one-two off a pair of United legs and lifting a cross towards the head of Gross, who headed home the crucial goal despite Rojo's attempted clearance. Now the Seagulls soared. The twinkle-toed Knockaert had come alive again, and Izquierdo nearly added a second with a low effort that skidded just wide of De Gea's near post. United would come back, of course, and Hughton would have known that the dominance would not last. Mourinho threw Jesse Lingard into the action, and both he and Rashford cannoned shots towards Ryan as the pressure began to build. Brighton, though, were never going to crack.